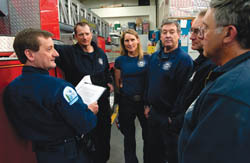 Ketchum and Local 4758, the city’s full-time firefighters union, have allowed each other a farewell to arms, for now. Following years of negotiations and court actions, both the council and the union members voted unanimously during a City Council meeting Tuesday to approve a contract between the two parties. “This contract is a result of a lot of work and a lot of compromise from negotiating teams from both the city and the union,” City Attorney Stephanie Bonney said. The council voted 3-0 to approve the contract, with Councilman Baird Gourlay absent from the meeting. Union President John Rathfon said in an interview that the union members voted immediately after the meeting. At the meeting, Bonney said the union had requested that the city “go first.” When the council members approved the contract, they received an ovation from about 20 firefighters (including some nonunion, paid on-call firefighters). In interviews after the meeting, Mayor Randy Hall, Bonney and Fire Chief Mike Elle said they, too, were pleased the negotiations are over. “I’m glad we’re moving forward with working together to protect our citizens and the public we serve,” Elle said. The 13-member union, formed in 2009, has negotiated since its inception for “for-cause” terminations, which city employees had before the city made changes to its employee policies in 2005. With the policy changes, the city switched to “at-will” employment, which means it does not have to give a reason for termination. In April 2011, the union filed a lawsuit against the city, claiming that the city was not entitled to make changes to terms and conditions of employment without union input while the parties were engaged in collective bargaining, that the city refused to engage in collective bargaining as required by state law and that it refused to execute an agreement reached between the parties. In November 2011, a 5th District judge ordered the parties back to the negotiating table. The city and the union met in July 2012 to continue negotiations, which both Rathfon and Hall said then were productive. Rathfon said then that the union’s attorneys were working on language for an acceptable way that at-will status could appear in the contract. In December, Rathfon said the union and the city had unofficially agreed to a “form” of at-will employment and they’d likely “ratify” a contract in January or February. Bonney said the form of at-will employment agreed to in the contract involves a “progressive discipline policy” which the city needs to go through before it can terminate an employee. She said the progressive discipline policy is included in the city’s policy manual for other employees, and that the version of at-will in the union contract is about the same as in the regular policy. Bonney said other compromises that the city made, in comparison to its policy for other employees, include allowing “more relaxed” rules on nepotism, residency and accrual of vacation days and compensatory time off. Bonney added that perhaps the most difficult compromise for the city was to grant the union the right to binding arbitration. On Jan. 9, 2012, the city appealed the 5th District Court’s ruling on the lawsuit to the Idaho Supreme Court. Rathfon said in the interview that the union would rather not spend more money on legal fees and that the union hopes the approval of the contract will make the appeal moot in the eyes of the court. Bonney agreed that the Supreme Court might decide that the case is moot, but said the city is continuing with the appeal in a hope that the court will provide some guidance that the city can use in future negotiations with the union. Bonney said the Supreme Court has not yet set a date for a hearing, but she expects one to be set in four to six weeks. She said a decision might be handed down in six to eight months. The contract expires in September 2014. Hall and Rathfon said both parties will likely renegotiate the contract starting about six months before then.